Alexandra Park follows the course of the stream that runs from Old Roar Ghyll out to the sea by the Queens Hotel. Much of the stream now runs underground in a culvert, but until the early 19th century the area we think of as Queens Road was low-lying and marshy pastureland with the Priory Bridge where the main traffic island is today. There was a water-mill on Waterworks Road, and higher up the valley towards the Shornden and Newgate Woods, hops were grown. In 1849 the appearance of the area was radically changed by the building of the railway embankment, effectively cutting in two, the upper and lower parts of the valley. For over 40 years the only way through this embankment was via a narrow brick tunnel, so low that passengers on horse-drawn buses had to duck to avoid hitting their heads. The tunnel was only finally replaced by the present iron viaduct in 1898. ---The situation is beautifully romantic; for after long, heavy rains a large body of water tumbles over with a tremendous roar that is heard half a mile off ". In the 1830's the stream was diverted to feed the Buckshole and other reservoirs and the water was reduced to a trickle. Visitors still walked to the spot through the hop gardens but guide books warn that the path "is less adapted for ladies". The first real garden on the site of Alexandra Park was created by a local tradesman, Mr. Shirley, in the 1830's, and was known as "Shirley's pond". It ran from the present entrance to the Park by the War Memorial to the Park Cross Roads. In 1864 this garden was taken over by the Corporation and opened-to the public as St. Andrews Gardens. In 1886 the Gas Band was given permission to play, and in 1867, a garden constable was appointed "to prevent skipping, leapfrog, kiss-in-the-ring and persons from walking on the grass edging". Ducks and geese were purchased, and by 1871 had become so numerous that two were sent to each member of the Council in an attempt to reduce stocks. In the same year, the trunk of an old oak from the submerged forest, dredged off Hastings Pier, was put on show in the gardens. In 1872, proposals were put forward to extend the grounds to include the Newgate and Shornden Woods and Buckshole Reservoir. Shornden Wood originally covered a much greater area and on Samuel Cant's map of 1746, it is shown extending right through to the Green. Newgate Wood can be traced back to Tudor times and in the 18th century was, along with Buckshole, a notorious haunt for smugglers. ---It appears that the water is impregnated with iron . . . to an unusual extent, containing a larger amount than the waters of Tunbridge Wells, Scarborough, Whitby, Buxton or Bath. It also has the advantage of not causing constipation -. 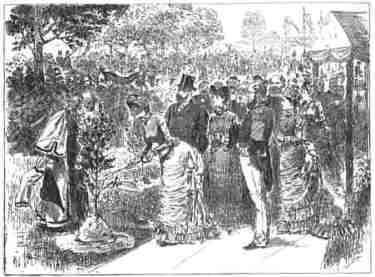 On June 29th, 1882, the new Alexandra Park was formally opened by the Prince and Princess of Wales. To commemorate the occasion two trees, an oak and a beech, were planted by the Royal couple in the vicinity of the bandstand. There was a slight upset in the proceedings when the handle of the silver spade, made especially for the Prince from wood from the submerged forest, came apart in his hand. Otherwise the celebrations seemed to have passed off well. A castellated arch was built across the entrance to Havelock Road from the station yard and the Princess was presented with a bouquet of seaweed by the boys of Highbury House School. After receiving a loyal address from the fishermen and visiting a convalescent house for children in West Hill Road, St. Leonards, the Royal couple ate a late luncheon at the Warrior Square Rooms, and left from Warrior Square Station around four o'clock in the afternoon. Since the opening of the Park in 1882, there have been several additions. In 1931, Thorpe Wood was added, and in 1933 and 1937 the lower and upper parts of Old Roar Ghyll. The park now runs for 2.5 miles through the centre of the town and covers 110 acres. In this way the historic scenery of the Old Roar Stream and neighbouring woods has been preserved for the enjoyment of the town and its visitors. Our fore-fathers must be congratulated for their fore-sight and planning in the development of Alexandra Park. These 110 acres situated in the centre of the town provide a magnificent green oasis in which residents and visitors alike can find something of interest from horticulture, recreation to natural history. The Park, which stretches over 21/2 miles, is sheltered from the prevailing southwesterly winds by mature trees, many of which are referred to elsewhere in this booklet, enabling a wide variety of hardy, semi-hardy and sub-tropical plants to be grown. The first park constable was appointed for the purpose of controlling such activities as skipping, leap-frog, kiss-in-the-ring and persons walking on the grass edging; since then standards have changed considerably. Holidaymakers can also enjoy a relaxing, but nevertheless skilful, game of bowls on some of the finest turf in Hastings, a game of putting, or boating on the lake, and for the more youthful and energetic there is lawn tennis throughout the summer or hard courts throughout the year. Now, children and people are encouraged to walk upon the grass, picnic and enjoy the relaxed atmosphere of the park. One of the main attractions of Alexandra Park is its wide variety; blending gracefully from the long informal lawns through the formality of the rose garden and bedded area, to the informality of the natural areas of the Ghyll, Thorpes and Coronation Woods, which attract a wide variety of birds. Residents include nuthatches, jays, magpies, greater and lesser spotted woodpeckers, coots, tufted ducks; mallard and seagulls are frequently seen on the swannery at Shornden, and occasionally the blue flash of a kingfisher is seen over Harmers Pond. In spring, and again in autumn, migrating pied flycatchers, wheatear and whitethroats pass through the park. Gone are the hop fields near the Ghyll, but the cool sylvan splendour of the walk alongside the stream, passes by one of the tallest alders in the British Isles; here, wood anemones, bluebells and yellow archangel, flower in spring before the total canopy of beech and oak leaves reduce to a dappled shade, the sunlight of a summer's day. information based on Hastings Borough Council's booklet "Alexandra Park Centenary 1982"